Afraid they won't hear you over the roar of the crowd? 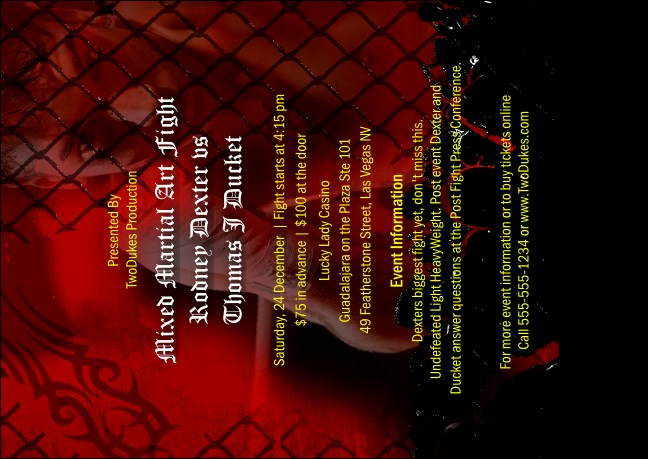 Get the word out early with a red Mixed Martial Arts postcard, part of a matching event kit for any type of physical combat exhibition or tournament. You don't need to fight to make your announcement loud and clear: just choose the right postcard template for any event and leave the printing to us! For professional, economical event kits, TicketPrinting.com has the market cornered!